Notes: Note about photo, socks are really the same length. The light was funny that morning and that pose was the best that could be done. I had some serious trouble with the Middle-eastern wrap method of casting on. But found a super tutorial with detailed photos at the hello yarn blog. This made the whole thing much simpler to understand. Truth be told, I really like this method of casting on. No crochet hook or waste yarn to work with/carry around/muck up my knitting bag. Side note, the waste yarn always gets tangled around another WIP, no matter what I do. So to completely leave it out of the travel knitting bag is a welcome relief. Back to business, I also like the shape of the toe this cast on creates. It seems to me to be less pointy and more round in shape. I mentioned here that the toes seem very roomy. They are and it's ok with me. Once I got farther into the sock, things seem to hit my normal sizing and changing needles was not necessary. Summary, this is definitely a cast on method I will continue to use. The yarn was more fun to work with that I expected. Since I gifted them the minute they came off my needles, I don't know how it is washing up. But while knitting it seems firm to work with, but created a nice soft fabric. In the simple ribbed pattern the colors looked great, with the yellow and grey making a nice pop of color in all the purples and pinks. So all in all, I am happy with these and can count them in the 52 Pair Plunge. Caution ~ extremely long catch up post ahead. Missed you all and I am glad to be back! Wow, can I get a fabulous guest blogger or what?! My big head is taking up most of my living room right now. Thank you JJ for the kind words, they left me speechless (which as anyone who has ever talked to me knows, can be virtually impossible). A word about JJ. Don't let her fool you, she is kind hearted, emotional (in a good way), eloquent (check out her new blog, mum's the word if you don't believe me) and the best sister anyone could hope for. Though we haven't always seen eye to eye (understatement is strongly implied here), I will always loved her. BTW - She was not as naughty as she would have you believe . . . dealing with past grief in an uncomfortably tense situation is hard on anyone. I give her substantial credit for staying as cool as she did. Like fish, family house guests begin to stink after a few days. I'm not certain that's how the saying goes, but it works for me. I'll be the first to say Arizona at 104 degrees, mom having surgery, mom's 70+ smotheringsignificant other, and a three hour time difference and hospital food all add up to Very. Stinky. Fish. Yet Mom is recovering nicely and life is returning to normal. Plus I got to see LG - a lot. I just love him and he never got stinky. His #@&! doesn't stink. 1. NEVER ride with 70+ people in a vehicle if you need to be somewhere fast. Standard driving speeds . . . 5 miles BELOW the speed limit. Yep, slow, rotting torture in a vehicle with minimal air conditioning. 2. You know it's truly not hot until you have sat on a porch drinking coffee at 6:30 am with temps already in the 80's . . . knowing it will get up to 104+ in only a few short hours. 3. Grass is a truly beautiful thing. 4. Tucson has a drug store on every corner - it's true. 5. When you want to go somewhere with my mom, start getting her ready two hours before so you will only be 20 minutes late. 6. You can get lots of knitting done while waiting in hospitals. 7. Some neuro-surgeons are really good looking. 8. Every house in Tucson is some shade of . . . brown. Call it brown, tan, beige, taupe, camel, whatever it's still all the same. No offense to any Arizona residents, I just couldn't believe all the brown. 9. If you are going to haul a baby from hotel to hospital some seven thousand times, a car seat bungee corded to a luggage cart makes an instant stroller. CJ, you saved our lives on that one. 10. Upon arriving home, my definition of clean and RM's definition of clean are two entirely different things. 11. All sorts of things can go amok at home when I was gone. Toilet repairs, water softener replacements, boards on deck broken/repaired, no-show sitter, truck dies - purchase new one (yea, you heard me right), and install surround sound in the living room. RM was a busy, busy man while I was away. 13. In Arizona there is no time during the course of 24 hours a can person run outside - it's just too damn hot. 12. Purls is a fabulous yarn shop! I did make some fabulous purchases. Did I mention it was hot there? In knitting news, I completed the Marigold socks, JJ's Jaywalkers and Mom's On-Your-Toes Socks. Sorting out all the photos I took is taking some time, so they should be posted in a few days. It's good to be back in temperatures I can stand . . . by the way, it was hot there! What have I done for her lately? Not enough, I can tell you that. Hello, there! JJ here. For those of you who read Trixie's blog, you can frequently find me commenting on her posts. I am Trixie's younger sister (though she would be quick to tell you that most people cannot actually distinguish which of us is the eldest) and I have the distinct pleasure of being her "guest blogger". I really don't know what I did to earn this right, but here I am and I have lots to say. My primary charge is to let you all know that Trixie is alive and well and will be back blogging with all of you very shortly. As you probably read in her last post, she took a trip to Arizona for a family member's surgery. I will let her divulge what she wishes regarding said surgery; but for now, suffice to say that it went well and the recipient is recooperating peacefully at home. 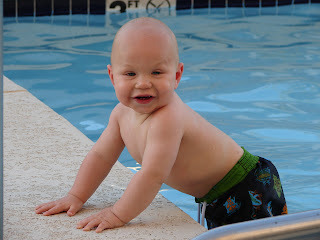 I went to Arizona as well with my 11 month old in tow. Having an 11 month old while trying to care for a loved one in the Intensive Care Unit where babies are not allowed proved to be quite a challenge, but Trixie stepped up. Without her help, I would have done just as well to stay home. Thanks, Trixie. My secondary duty is to show you the socks that Trixie made for me. (Please forgive the picture placement...I was lucky to figure out how to get the picture there at all!) 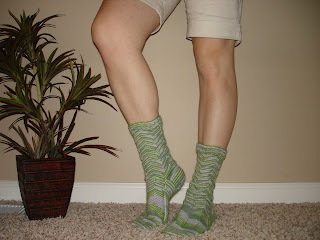 I dropped as many hints on this blog as possible that I wanted those socks! I saw the Mountain Laurel yarn, seen in "Solid Gold Sweet Feet", and knew that I just had to have them. So what happened? Trixie stepped up. I don't know the pattern or needles she used and I don't know how long they took her, but I do know I. Love. Them! I vowed to wear them in Arizona despite the heat and I did just that! I had those socks on every day and boy, are they comfy! Those are the things that Trixie asked me to share. And having done that, I can now share an observation of my own. There are times in life that call you to be all that you are capable of being. This past week was one of those times for Trixie and me. It was a week where the things you do show who you really are and what your character is made of. I can tell you that my behavior left something to be desired, but ...you guessed it...Trixie stepped up. Now, I am the sort of person who likes to help others. I'll open a door for a frustrated delivery man who can't get the door open. I pick trash up off the streets. I hold elevator doors. I will listen to the venting of my beloved sister. I enjoy giving gifts. But this past week, I was too involved in my own emotions and let them take control of me. But not Trixie. She did all of those things and many more despite going through hard emotions herself. She made volatile situations more calm. She showed who she really is and she can be proud. I know I am proud of her. She made me feel beter, she made me see things in a new perspective. She made me ...look bad! Just kidding. She demonstrated grace and an inner fortitude that I can only admire at this point. So, what have I done for her lately? I posted a blog when she didn't have access to a computer, and I hope that' s enough to tell her how very much I love her. Here is what we have been watching the last few mornings. They have gone directly over the house, which is beautiful but noisy. Who ever said balloons were quiet - lied. They go over our house at the ungodly hour of 7:00 am! I don't know about you, but after a late night, I want all the sleep I can get. Hearing those propane burners fire scares me awake faster than the third snooze on the alarm clock. So I am up, might as well take a few photos. Standing at the end of the dock, drinking my morning coffee I enjoyed the sights. 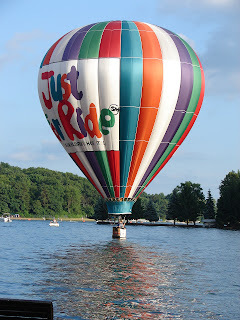 The balloon festival was in Battle Creek this past week. Ours had several balloon launches/competitions, a carnival and an airshow. 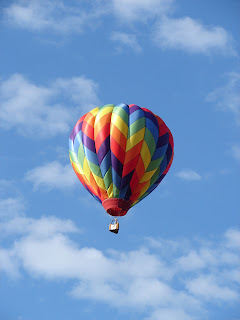 Later in the evening we were having dinner with friends out on the deck and I heard the burners of this balloon. It came from the East and started to descend - close to our dock. Very close to our dock. Startled, cool, close to our dock. But it was fun because part of the competition tasks can be to touch down on the surface of the lake, which several did. Well, I get to see this little man this weekend! Yea for me. You see, he is now walking and saying a few words and being as cute as a bug in a rug. Auntie Trixie will spoil, spoil, spoil him. He is the only little one coming along on our trip. This leads me to the fact that I am going to Arizona for a few days. This is a trip I make alone to tend to some family health issues (I'll be bringing lots of rice cereal). Should I be excited to go to Arizona in July?! I'm thinking that January would have been a better time to plan a trip. Yet, this is really unforeseen and no manipulations of timing could be made. I will get to spend a good amount of time with JJ and her little man in the waiting rooms of the hospital, so we should get lots of knitting done. I will try to post as I can. See you in a few days!